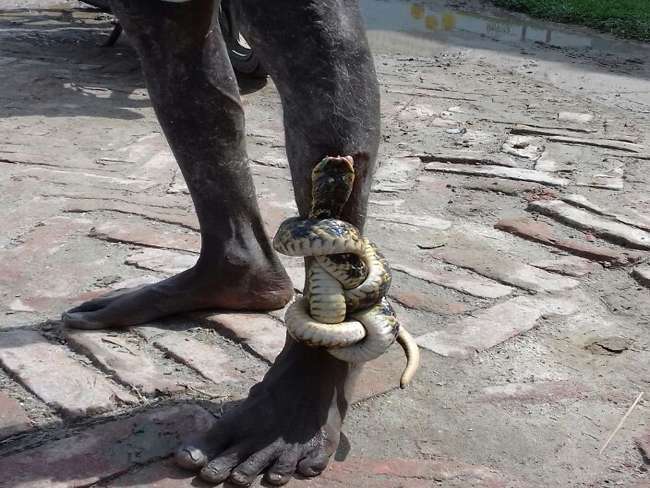 PATNA: A man rushed to a local hospital in India’s Bihar state with a snake wrapped around his left leg after the reptile refused to let him go even after biting. The bizarre incident took place in Madhepura, a north Bihar district some 250 km form Patna, on Saturday. Reports said a farmer, a resident from Hathiyondha village under Bihariganj police station in the district, was working in his farmland when the snake accidently came under his feet. The reptile hit back soon by biting the man in his left leg with all his might but failed to release the enemy as his teeth got stuck deeper in victim’s flesh. Witnesses said the snake tried hard to release its mouth but when failed in his attempt, it finally tightly wrapped around the man’s leg. Initially, the farmer got panicked but left with no option, he straightway rushed to a nearby government hospital. It was then that the health officials removed the snake identified as “water snake” from his leg and freed it. Doctors also discharged the farmer after primary aid. As luck would have it, the snake was not poisonous or the victim would have been killed since the reptile pierced its teeth with all its might in victim’s flesh. The video of the snake encircling the man’s leg has now gone viral in the social media.